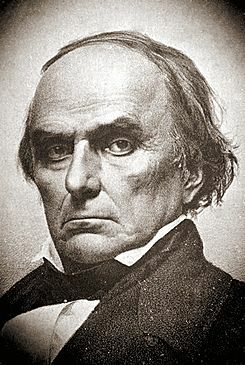 Daniel Webster (January 18, 1782 – October 24, 1852) was an important American statesman. He first became famous because of his defense of New England shipping interests. In his life, he became more and more nationalistic, and convinced many people to become nationalists too. This made Webster one of the most famous orators and powerful Whig leaders of the Second Party System. Webster did not like slavery, but he thought it was more important for the Union (the United States) to stay together than anything else. Webster became the northern member of a group known as the "Great Triumvirate". They included his colleagues Henry Clay from the west and John C. Calhoun from the south. His "Reply to Hayne" in 1830 was generally seen as "the most eloquent (powerful, fluent, well-spoken) speech ever delivered in Congress." Webster tried to keep the nation from civil war, and make them have a firm peace. His efforts did not succeed, but he was still respected for them. He was officially named by the U.S. Senate in 1957 as one of its five best members. Daniel was born on January 18, 1782. His parents were Ebenezer and Abigail Webster (née Eastman) in Salisbury, New Hampshire, now part of the city of Franklin. He and his nine siblings grew up on his parents' farm. Daniel Webster's great-great-grandfather was Thomas Webster (1631–1715). Thomas Webster was born in Ormesby St. Margaret, Norfolk, England and settled in New Hampshire. As Daniel was a "sickly (unhealthy) child", his family often let him have whatever he wanted. They also exempted (gave freedom from duty) him from working on the farm. Daniel Webster became a lawyer and politician. He was elected to Congress as a Federalist. He supported free trade, opposed both Abolitionism and the expansion of slavery, and opposed the War of 1812 and other policies of the Democrats. When the Federalist party declined, he joined with other former Federalists and National Democrats to form the Whig Party (United States). Always Webster supported the unity and harmony of the nation against various divisive schemes. Daniel Webster monument, Central Park, New York City, from the base: "Liberty and Union, Now and Forever, One and Inseparable". Webster Hall, at Dartmouth College, houses the Rauner Special Collections Library, which holds some of Webster's personal belongings and writings, including his beaver fur top hat and silk socks. Portrait of Daniel Webster chosen by Senator Kennedy to adorn the Senate Reception Room. Daniel Webster Memorial located on Scott Circle in Washington, D.C.
Daniel Webster Facts for Kids. Kiddle Encyclopedia.